It will mow over the competition. It’s a cut above most reel mowers! But I would never do that… Instead I will say I thoroughly enjoyed using it to mow my lawn yesterday. I found that it lives up to the statements in the press releases, and I predict that it will be much sought after this spring when it hits the stores. As way of background, I’ve been mowing my own lawn since 1987 and of course did plenty of mowing growing up in suburbia. In '87, I started out with a reel mower, mowed all of ten feet with it, then put it back in the box and returned it because it was just too hard to mow and it cut very unevenly. I then resorted to a cheap, bottom of the line gas powered mower until around 1991, when I moved and purchased a cordless rechargeable electric mower. It had just enough charge to mow my lawn, but if the grass was thick, I had to really hustle to get it finished. Then I moved to my current lawn and replaced the electric mower with another gas-powered mower, choosing to upgrade to a self-propelled model. That lasted a few years and then the self-propelled part stopped working, so I sold it for $25 and bought another self-propelled mower, choosing a top of the line self-pacing, mulching mower. And that’s what I’ve been mowing with prior to trying out the Fiskars® Momentum™ Reel Mower yesterday. It was the last cut of the season, so I set the mower to a height of two inches and think I cut off about one half to three quarters of an inch. The mower can be set as high as four inches, which is good because usually I mow my bluegrass-perennial rye-fescue lawn at a height of around three inches. I did not have any troubles pushing the mower and decided it took just a little more “oomph” than the self-propelled mower, but was easier to push than an old spare bottom-of-the-line gas powered mower that I also have. I do have a slight incline in the front, but was able to push the mower up it without too much extra effort. I was also impressed by how quiet it is. I was able to overhear two neighbors bantering across the street at one another about the big sports story of the day, which coincidentally was about a certain golfer who would appreciate a well-mown lawn or fairway. I was also able to hear my phone ring (I always carry it outside with me), answer it, and start talking to my sister without having to stop mowing. I also was able to mow one handed while shooting a video of the mower working with the other hand. I’ll upload it later so you can see how that works. And now I can’t wait until spring, when the grass is growing again, to try this mower out in taller grass. I’ll post more about that when I do so. 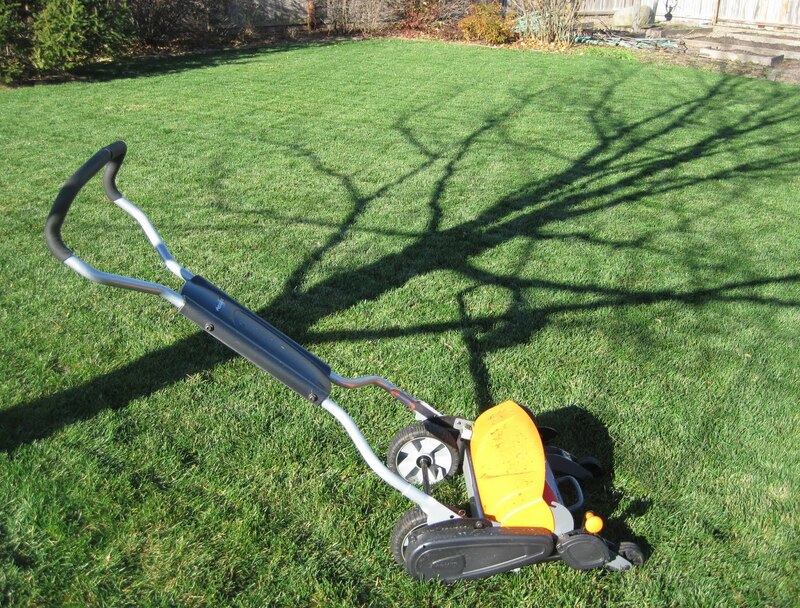 Thank you to Fiskars for sending me a Fiskars® Momentum™ Reel Mower and giving me the opportunity to try it out. If anyone has any questions, feel free to leave a comment or send me an email, and I'll answer them as best I can. Those statements are more in the nature of puns, which I love. (Remember the Save the Pun Society?) I'll use a reel cliche from the movies: "I have got to get me one of those!" Quiet, clean, cuts well, not too hard push, what more could I ask for? Do you have idea what the price is going to be? It sounds great, but my budget is about the level of "used mowers from craigslist"
MMD, thanks, you are right, those ARE puns. I fixed the post. Greensparrow, don't quote me but I've heard they will retail around $199 this spring. Start saving now! Great post. And I think objective. Though I have NEVER heard any one say they can't wait to mow. Is that for reel? Fiskars are really generous when it comes to members of the GWA. I have not made it to a symposium yet but hope to. We have our annual region meeting at Canada Blooms and Fiskars gives us all kinds of stuff. This year I was trying out a new rainbarrel for them that turns out had a flaw in the design so I was given an already established one to use and I love it! I've been reading a bit about their new reel mower so was happy to see you posting about it. You make me want to try it. How much of an incline do you have? Mine is 16 feet per 100 feet. H.
The lawn mower sounds great, but I - or rather my husband - refuses to think about lawn mowers at this time of the year. We have an old 24 inch reel mower in the shed, Meg brought it here. I have never tried it as it is old and does not rotate very well. So I bought a 24 volt electric mower this spring. Just mulched a bunch of leaves for the compost with the bag attachment. Thanks for the review. I love the concept of mowing using a reel mower, especially the quiet but the reality of most of the ones on the market is that they constantly need sharpening and they just don't move that easy. This one looks like it may be the exception! I live near Los Angeles. I'd be happy to let this mower stay in shape by mowing my grass with it all winter long! Just thinking of it sitting unused in a corner somewhere - sad, sad, sad. Come to think of it, if you wanted to actually DO the mowing, even better! Thanks for the review! I look forward to giving it a push myself. It's about time someone upgraded this green machine - burns zero carbon and 100% thigh. I want one as soon as it comes out. I actually like to mow, but didn't want a gasoline mower and my yard is too big to mow with a "regular" reel mower. I've been eyeing this since word of it came out months ago. No gas, quiet, healthier cut of reel vs gas, etc. - all sounds good. I think I'll be cutting my lawn every two weeks. Not sure if that's too much time, but it's all the spare time I have. Consumer reports had a report that came out that said it was a chore to push. I guess I'll have to find out for myself. I think those are fundamental flaws and it is surprising from this company. Now that you have had the Fiskars reel mower for a few years, do you still have a favorable opinion? I am thinking of purchasing one, however I would like to know how you think it would fare on centipede grass. Thanks! LMO, I am not familiar with centipede grass, so I don't want to speculate on how this mower would do cutting it. It's still a nice little mower for a small lawn.